Happy birthday to the perpetual adolescent brat! The moody, cranky, destructive little pockmarked teenager with an ax to grind against authority and parents, and something else entirely to grind against the girls too sophisticated to grant him the time of day. It’s the 50th birthday of The Who Sings My Generation, and the candles on this cake are of the Roman fireworks kind, packed with thundering hormones, ultraviolence, chaos, and primal screams. 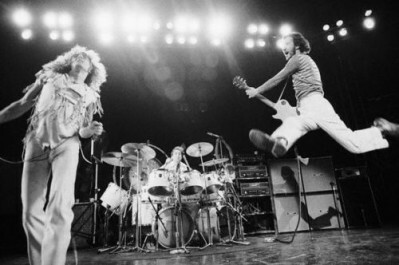 Substitute, if you will, those four categories for the personalities comprising the Who, and you wind up with truly rock’s first power trio featuring an added vocalist who sometimes doubled on mouth harp and rhythm guitar. Disagree? Think of the scene in Franc Roddam’s brilliant screen adaptation of Quadrophenia in which Jimmy, the classic working-class British boy, sits on the couch with a girl who fancies him, while he moons over the girl he prefers as she slow dances with another, more handsome and better dressed, bloke to the strains of the Cascades’ “Rhythm of Rain.” In the middle of a makeout session with the girl who fancies him, he catches the eye of Stephanie, the girl he adores from afar. He extricates himself from the embrace, scratches the phonograph needle across the record, and replaces it with “My Generation.” Getting the girl you fancy out of the embrace of another? Fait accompli! Not that “My Generation” requires any explication at all. As noted by Pete Townshend himself in Another Tricky Day,” a (much) later song from Face Dances, “It’s all there on the vinyl.” And yet, sometimes you want Proust and other times you want short-story Hemingway: compact, solid, filled to the brim with images, allusions, emotions, and sass. Don’t have the time or energy for four sides of it at the moment? No worries, “My Generation” (the song) is the perfect CliffsNotes version. Is it any wonder the successful cover version of the song is by Patti Smith and John Cale, albeit a considerably more expletive-laden rendition? What else can be written about the feedback and anarchy in a song that predates the Stooges, the Velvet Underground, and the punk explosion? If WSMG’s lead-off track doesn’t set listeners’ hair on fire, there’s the amphetamine-induced “The Ox,” a nod to the Ventures’ brand of surf music if a surfer were inclined to practice the art on a tsunami engulfing London during the Blitz. The feedback from Townshend’s (or, as suggested by some, Jimmy Page’s) guitar is only the first delight of this pre-Cream power trio workout. Both drummer Keith Moon and bassist (and composer) John Entwistle display supernatural musicianship and endurance as the trio invent heavy metal well before Moon provided Jimmy Page with the name of his group (you know the story). Stuttering Jimmy from “My Generation” calms down for his narrative return on “The Kids Are Alright,” a song that perfectly counters its predecessor. Whereas Jimmy celebrates his tribe on the former song, he acknowledges a sense of not completely belonging to it in the latter. Either he wants to be apart from the crowd alone, or, more probably, alone with the girl he states he doesn’t mind dancing with the other boys. Contrast this with the more sinister “The Good’s Gone” on the album’s second side. Where Townshend came up with the lyrics for “A Legal Matter” is anyone’s guess (probably from observing Roger Daltrey’s divorce at the time), but it’s a humorous approach to a man walking out of an unhappy marriage, and one incorporating a terrific lead vocal by Townshend. The American rhythm-and-blues Daltrey loved shows up in a wonderful triptych of songs—“Out in the Street,” “I Don’t Mind,” and “Please, Please, Please”—that display the nascent blues shouting Daltrey would deploy fully in Tommy and the cocksure stage mania of Live at Leeds. Although Daltrey’s status as vocalist of the Who sprang fully formed from its inception, Townshend grew in his ability to write songs matching his singer’s vocal mastery. Motown meets Cliff Richards in “La-La-La-Lies,” which features Keith Moon swinging with a Gene Krupa vibe and Entwistle’s bass underpinning the proceedings in a manner that would’ve made James Jamerson proud. It being 1965 and all, it only makes sense that Daltrey does an admirable Bob Dylan impression on “Much Too Much,” which owes as much to the Turtles’ fantastic cover of Dylan’s “It Ain’t Me, Babe” as to anything actually recorded by Mr. Zimmerman. “It’s Not True” would’ve fit nicely on an early Mary Wells or Supremes record, and album closer “Instant Party” features a nice guitar chord progression that is recognizable from any left-of-the-dial band from the 1980s, a French horn lead that lends an otherworldliness to the song, eerie singing from Daltrey, and Mod guitar thrashing throughout. It’s a masterful ending for a masterful recording, an album that sounds as fresh and original as it did the first time I listened to it all the way through, in high school (nearly a decade after its 1965 release). A half-century later, you have to give it up for a group coming right out of the chute with one of the greatest, most influential, and, yes, most cathartic albums of the rock era.